I’m always on the hunt for a good cleaning product. If it delivers positive results and makes my life easier, it’s a good product in my opinion. If it’s a multitasker and doesn’t break the bank, it earns some extra brownie points. Lastly, if it makes my house smell nice, well then that my friends is a product that is hitting a home run! Actually, wait, almost forgot something. Before we reach home base there’s something else that’s become very important since becoming a mom. I don’t like any harsh, scary chemicals. Now I’m not necessarily banning all bleach-based cleaning products (and we all know that bleach is the convicted offender every time we throw around words like harsh and chemicals) I just want to avoid them as much as possible for now. No need to have my precious little angel around those chemicals if there are other options. Luckily, seventh generation disinfecting multi-surface cleaner and green works bathroom cleaner have turned out to be two great options. I’ve been using these cleaners for the last couple of months. I purchased both from Walmart and they were very affordable. 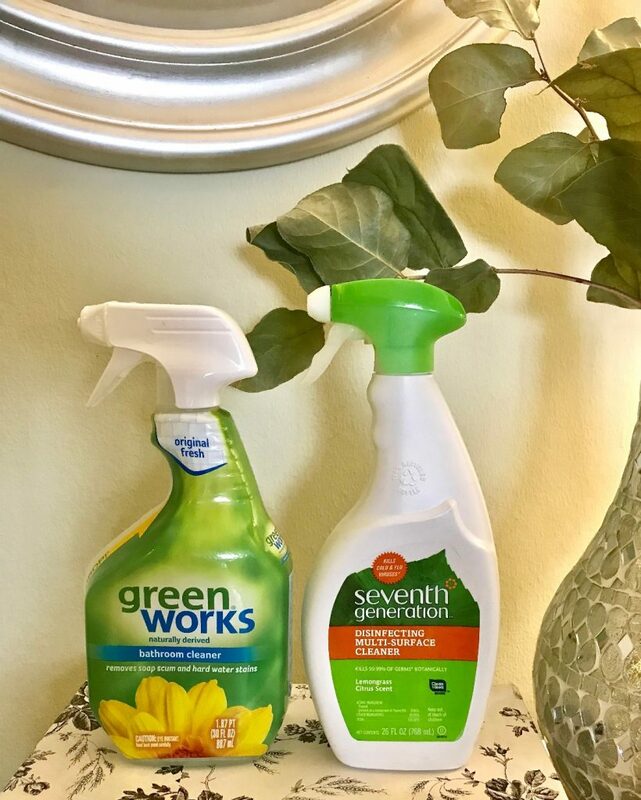 The seventh generation cleaner was $2.99 and green works was $5.07. Don’t you hate those odd prices? Why the .07 cents? Why not even out that number? Anyway, they get the job done and I don’t have to worry about any scary ingredients. I like to use these products for every day messes like wiping down kitchen counters and quick cleanups in the bathroom in between my deeper cleaning days. Sadly though, they are not the best for bigger messes like burnt on grease which I did try to clean up the other day. I was feeling ambitious. I like to use this one mainly in the kitchen. I spray down all the counters, stove, and sink at the end of the day once I’m done washing all the dishes. Sometimes I like to spray our stainless steel trash can as well. It’s great because the solution has a lightweight consistency that doesn’t leave streaks or any type of film behind. I’ve tried so many multipurpose cleaners/disinfectants in the past that always seemed to leave behind a soapy film if I didn’t wipe everything down with a damp paper towel afterward and honestly, who has time for that? Not me. I want to be able to spray, wipe and move on to more exciting things like relaxing on my couch with some type of sugary snack that can’t possibly be good for me but tastes so yummy I can’t resist. Hey, don’t we all deserve a little treat after all the chores or a long day at work? Ok, ok, I’m getting off topic as usual. So like I said, I spray everything down then wipe. If I cooked chicken or something that may have left the surfaces in need of some disinfecting then I follow the instructions on the back of the bottle for disinfecting. Basically just spray the area down liberally, allow to sit for 10 minutes then no rinsing needed after. Easy peasy. I also recently used the seventh generation disinfectant to clean out my fridge. It was a quick and easy job. I removed everything section by section, wiped off any crumbs with a paper towel then sprayed and wiped. It took me maybe 10-15 minutes. As for the “lemongrass citrus” scent, it has an interesting smell compared to other multipurpose cleaners I’ve tried. It smells almost like herbs but it seems to be combined with another scent that is sweet smelling. This sweeter scent softens the herby smell. Its different from most cleaners but I like it. The active ingredient is thymol which I believe is found in thyme oil so the herby smell makes sense. I’ve been using a DIY solution of white vinegar and dishwashing soap to keep my tub and shower tiles clean for about a year now. I’d do this every time the area looked like it needed a good cleaning. It would always turn out to be an exhausting task. I start by spraying everything down, wait about 15-20 minutes and then go in and scrub away. I asked myself, why in the world am I waiting for things to get to the point that I have to scrub like a mad woman. I’d rather do a quick clean up every few days that only takes minutes that way my deeper cleaning days would be much easier. 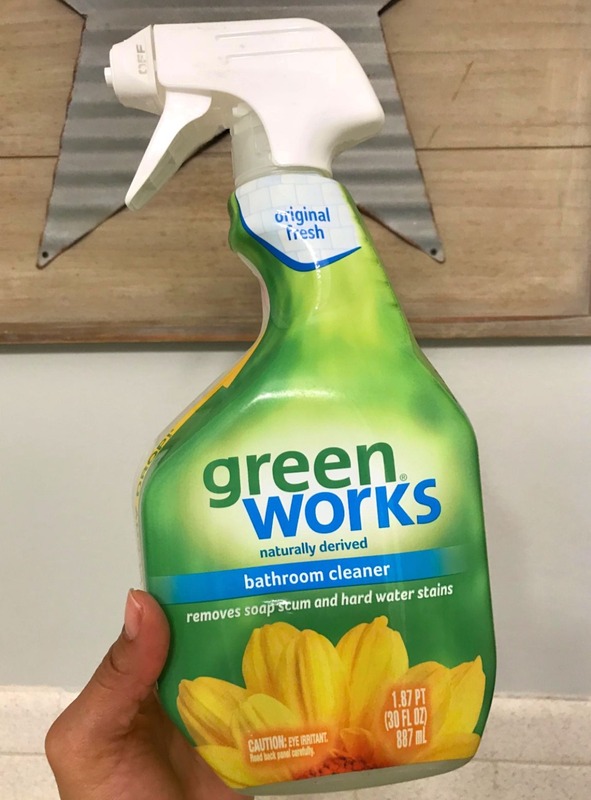 So I purchased this green works bathroom cleaner after finding it on walmart.com and noticed after the first use that it would become a favorite. 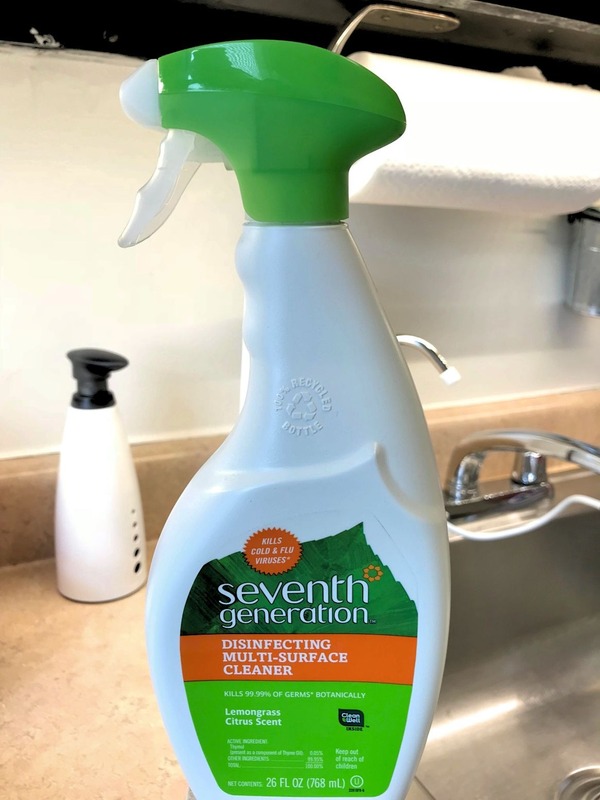 This product is just as easy to use as the seventh generation cleaner. I spray down the tub and tiles, usually at night after I shower and then I either rinse it off or wipe down with a sponge. I’m usually exhausted by the end of the day so rinsing is the most I’m doing on most nights but wiping down with a sponge gives me better results. I get more of a shine when I wipe as opposed to just rinsing and the shine will last for days! My only complaint with this cleaner is the smell. It has a light citrus like scent to it but there’s another scent mixed in that is almost “chemically” smelling. Sadly, it doesn’t leave behind a fresh scent once I’m done. Luckily though the scent does not linger around for long so I’m willing to look past it. So are these two products hitting a home run? Yes! Despite the fact that I’m not too crazy about the green works cleaner scent as well as the lack of positive results on more stubborn, heavier messes, they are still making my life easier. That means I have more money to buy myself things like an iced coffee or ice cream. I’m so easy to please. Unless they mess up my coffee, then I’m not happy. Hope these products make your cleaning routine a little easier as well if you decide to pick them up!